Research led by The Australian National University (ANU) has solved the mystery of how the first animals appeared on Earth, a pivotal moment for the planet without which humans would not exist. Lead researcher Associate Professor Jochen Brocks said the team found the answer in ancient sedimentary rocks from central Australia. "We crushed these rocks to powder and extracted molecules of ancient organisms from them," said Dr Brocks from the ANU Research School of Earth Sciences. "These molecules tell us that it really became interesting 650 million years ago. It was a revolution of ecosystems, it was the rise of algae." Dr Brocks said the rise of algae triggered one of the most profound ecological revolutions in Earth's history, without which humans and other animals would not exist. "Before all of this happened, there was a dramatic event 50 million years earlier called Snowball Earth," he said. "The Earth was frozen over for 50 million years. Huge glaciers ground entire mountain ranges to powder that released nutrients, and when the snow melted during an extreme global heating event rivers washed torrents of nutrients into the ocean." Dr Brocks said the extremely high levels of nutrients in the ocean, and cooling of global temperatures to more hospitable levels, created the perfect conditions for the rapid spread of algae. It was the transition from oceans being dominated by bacteria to a world inhabited by more complex life, he said. "These large and nutritious organisms at the base of the food web provided the burst of energy required for the evolution of complex ecosystems, where increasingly large and complex animals, including humans, could thrive on Earth," Dr Brocks said. The research is published in Nature, and the findings will be presented at the Goldschmidt Conference in Paris, France, this week. 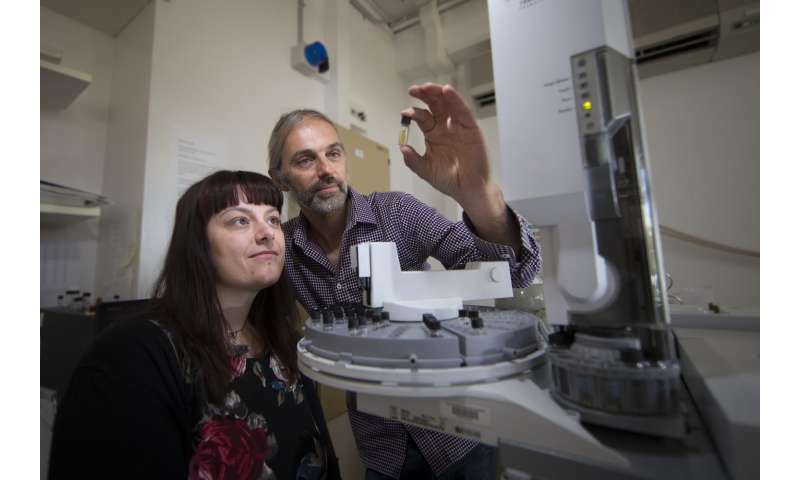 Co-lead researcher Dr Amber Jarrett discovered ancient sedimentary rocks from central Australia that related directly to the period just after the melting of Snowball Earth. "In these rocks we discovered striking signals of molecular fossils," said Dr Jarrett, an ANU Research School of Earth Sciences PhD graduate. "We immediately knew that we had made a ground-breaking discovery that snowball Earth was directly involved in the evolution of large and complex life." A Mystery is, by it's fundamental ephemeral contention, unsolvable. A Belief System based on Faith, never to be contradicted by facts, evidence or observation. Unknowns are not a mystery. Unknowns, may or may not be deduced, resolved, proved or disproven. Frankly & Ernestly, I do not understand why any scientists would allow their conclusions of incremental research be abused by lumping it on with stuporstitious ignorance. Algae would need the increases in CO2? This is an old and arguable hypothesis. The paper is paywalled, but the abstract describes the observations based on increased fossil diversity: "Increasing steroid diversity and abundance marks the rapid rise of marine planktonic algae (Archaeplastida) in the narrow time interval between the Sturtian and Marinoan 'snowball Earth' glaciations, 659–645 million years ago." [ctd] "According to our results, all non-bilaterian phyla, as well as total-group Bilateria, evolved in an ancient radiation during a geologically relatively short time span, before the onset of long-term global glaciations ("Snowball Earth"; ~720–635 Ma). Importantly, this result appears robust to alterations of a number of important analytical variables, such as models of among-lineage rate variation and sets of fossil calibrations used." So there may be a correlation to the glaciations, but in that case those rather looks like caused by an ecological change rather than the opposite. Global glaciations appeared at lowered CO2. But increased erosion from ice and streaming melt water washed out phosphorous from sediments et cetera. I think that is the theory. @rrvillsj: Obviously good titles are clickbait (but also preferably reflecting the article). Science has unsolved questions which are often labeled "mysteries" when they are mysterious in nature. That does not imply they are not solvable. But equally obviously "unknowns" is a better term. @POS: Beginning and responses concerned themselves with evolution, which area the article described results from. Obviously you have to test evolution as the process it is, same as gravity is tested regardless it does not explain how masses came to be in the first place. Here you are barreling into question taphonomy of (molecular) fossils, which should be described in the paper if it is worth the paper it is printed on (passed peer review). Did you read the paper? @POS: Oops, it was my abstract excerpt:"steroid diversity and abundance". Which they get from sterols in the sediments.